When is the last time you rested in a state of total contentment, not wanting to change a single thing about yourself or the world around you? If you're like me, such quiet moments with no trace of willfulness or yearning are few and far between. Peacefully accepting the present moment, it seems, is a radical reversal of our habitual way of being in the world. And yet the practice of contentment lies at the heart of many spiritual traditions. The Buddha taught that clinging leads to suffering and that happiness develops from a tranquil mind that embraces the ever-changing play of life. Taoist master Lao Tsu taught that "when you realize there is nothing lacking, the whole world belongs to you." And the ancient sage Patanjali offered contentment as one of the five observances, or niyamas, that all yogis should practice, calling it the root of supreme happiness. So how do we cultivate balanced and wholehearted acceptance of life in this very moment? I must admit, I've been practicing yoga for quite a while now and still can’t summon up unbridled ease at the snap of my fingers. But I have discovered - as yogis have for centuries - that consistent practice can move us in the direction of deeper appreciation of life just as it is, and move us away from unending struggle and dissatisfaction. Even certain yoga postures have the power to drop us into a state of inner contentment, offering at least a taste of the quiet peace that spiritual masters tell us is our birthright. The restorative twist is one of these magical poses that halts the forward thrust of the world for at least a few sweet moments, dropping us headlong into the here and now. This combination twist, forward bend and restful position offers a refreshing stretch to the muscles of the back body, while calming and soothing frazzled nerves. Devoted practice of this posture also promotes full and healthy breathing, leaving your exhalations feeling like they’ve just returned from a week at the beach with not a single care in the world. To begin, fold two or three thick blankets lengthwise and stack them neatly, making sure they are long enough to comfortably support both your waist and head. (A long, flat bolster works well, too). Sit on your shins with your hips on your heels in vajrasana, or thunderbolt post, and place the blankets near your right ankle, pointing away from you. Close your eyes, invite your spine to lengthen, and let the boundaries of your body grow soft and tender. On an exhalation, spin your torso around to the right. Breathe easily here for a moment and enjoy this opportunity to gently wring out your spine. When you're ready to settle into the supported version of the twist, lean forward toward the blankets and place your hands onto the floor, one on each side of your support. Walk your hands away from you, slowly lengthening the spine, and bend your elbows to lower your chest to the blankets. As you do this, let the left thigh rise away from the heel and the right hip slip down onto the floor in between the right ankle and the edge of the bolster. The legs will likely unravel and separate a bit, leaving both knees resting on the ground and the left ankle nestled into the crook of the right foot's arch. Moving into the posture may feel a bit awkward the first time you try it, since the whole thing is a bit of a controlled fall, with your body tipping like a leaning tower toward the bolster. Don’t over-analyze the situation, just move as fluidly and easily as possible from the seated pose of vajrasana into the toppled-over twist. Trust that your body will arrange itself in a way that best accommodates your individual needs. 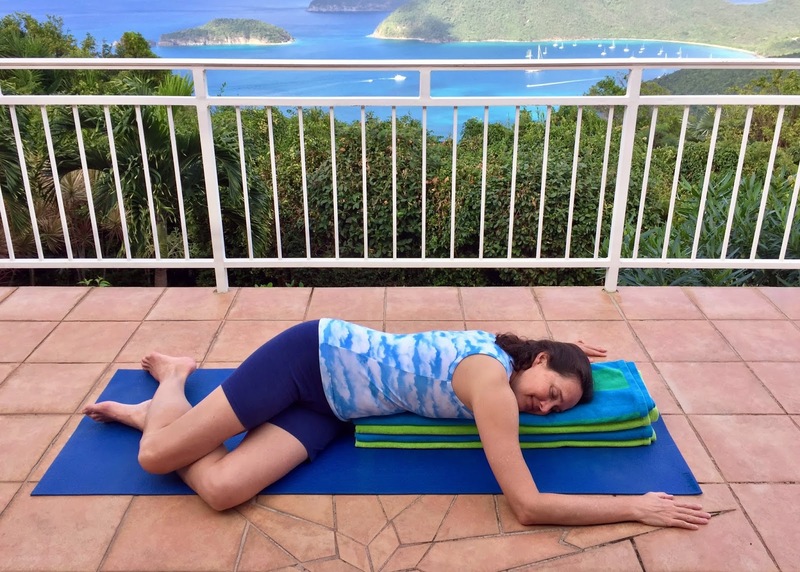 Once you’ve made your way into the pose, your head and torso should both be on the bolster with the nose looking in the same direction as the knees. The weight of your torso will rest somewhere between the front line of the body and the side waist, and the weight of your lower body will settle toward your right hip and thigh. Let the arms drape comfortably off the sides of the blankets, elbows bent and palms down, softly supporting you like outriggers of a boat. Don’t be surprised if in the beginning your breath feels a little choppy and your brain feels a tad perplexed. Your habitual breathing patterns are deeply challenged in this unfamiliar position, and your body needs a little time to carve out new pathways for life to pour through you. Never fear, for as the toughness in your torso dissolves over the next few minutes you’ll naturally discover a more balanced and whole-hearted way to breathe. Rest quietly, relinquish struggle, and invite your body to make peace with the experience of the moment, whatever it may offer. 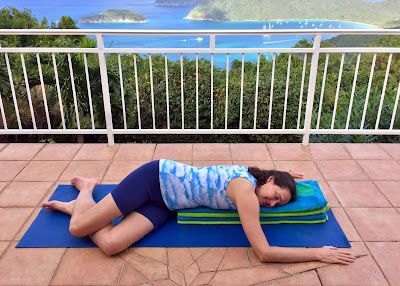 After several breaths of easing into the restorative twist, you’ll likely need to readjust your hips and spine to accommodate the new spaces within you. First, lift your right hip slightly off the floor and pull your pelvis toward your heels to lengthen the right waist, and then lower your hips back down. Next, press your hands onto the ground, gently lift your chest off the blankets and invite the spine to telescope out from the cradle of the pelvis. Slowly lower the spine back onto the support while maintaining its gentle extension. You may also enjoy the deeper twist that comes as you revolve your head to face away from your knees. This is a deep twist for the cervical spine, though, so avoid it if it creates discomfort. Now you have nothing left to do but settle in and practice the art of sweet surrender. Invite your mind to let go of all strain and resistance, and let your body mold itself to the shape of the support beneath you. Allow your bones to yield peacefully to the pull of gravity. Invite any armoring around your shoulder blades to soften so that the back of your heart can feel free, clear and breathable. As you rest here your breath will eventually find itself transformed into one sweet sigh of relief after another, each exhalation dropping you into a deeper state of relaxation and ease. Your body will break out of its straight jacket and be enlivened by the ebb and flow of each successive breath. Your spine may begin to undulate, your shoulders may gently rock and your head may even bob slightly as life pours through the nooks and crannies of your inner body. Your tough, protective shell will melt away, and a more resilient and tender-hearted creature will likely emerge. Linger here quietly for as long as you like - two to three minutes on one side is a good start. When you're ready to move on to the second side, press your hands onto the ground by your ribs and slowly raise yourself back up to seated. Sit in vajrasana for a few breaths and notice how the restorative twist has changed you. Does your spine feel longer? Does your breath feel freer? Does your brain feel a little less cluttered, a little aired out? You may even notice that the two sides of your body feel quite different from one another, or that your breath is percolating through one side a little more freely than on the other. Now turn yourself to face the opposite direction and settle into the restorative twist toward the left, making sure to steep in the pose on this side for the same amount of time as on the first. You may then like to repeat the twist again on both sides. When you’ve finished twisting for the day, turn your body to sit in vajrasana facing the bolster, and rest your head and chest onto the blankets for a few satisfying moments in supported balasana, or child's pose. As you rest here, consider whether your exploration of the restorative twist has offered a taste of contentment, filling your inner body with tranquility and ease. Invite any spacious acceptance you’ve unearthed to linger with you as you move on to the rest of your busy day. You never know, you may find yourself able to return to the world of action still carrying the seeds of contentment within.